Sorrento is the perfect destination for those who want to spend a very special Christmas away from home and that finally makes you discover the intense flavor of traditions and the beauty that Christmas spirit is able to bring. 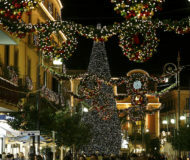 with Tree Day on December 1, the ceremony of the Golden Tickets on December 3, and national premieres, meetings and interviews from Piazza Tasso for the duration of the event. Not to be missed New Year’s Eve in Sorrento! Description: Sorrento is the perfect destination for those who want to spend a very special Christmas away from home and that finally makes you discover the intense flavor of traditions and the beauty that Christmas spirit is able to bring. Web Master & Web Consultant, with a strong passion for travel and entertainment in general I suggest those who, in my opinion, are the best events in Sorrento and Amalfi Coast.